A magnificent bookcase from Italy was carved about 1890 in the Renaissance manner with gargoyle heads and lion paw feet. Solid wormy walnut, the restored finish has warm antique patina. There are two separate banks of shelves. Four doors have working locks, wrought iron grills and textured stained glass. 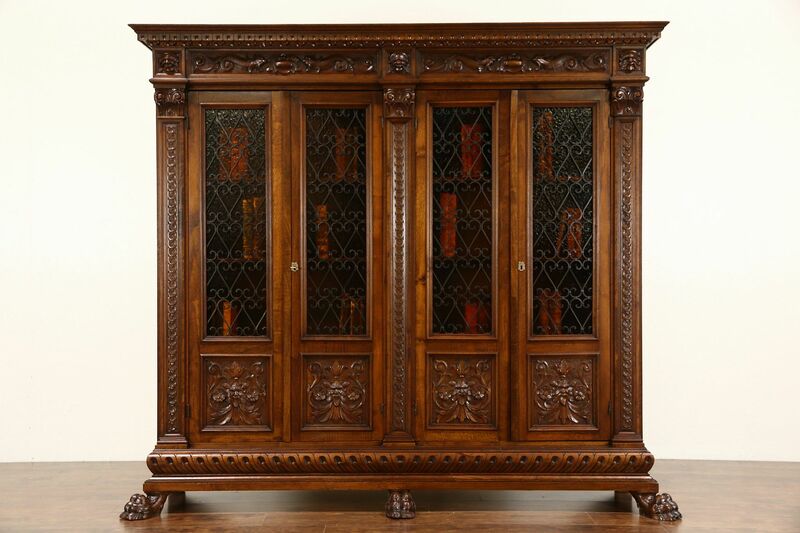 Classical hand carved detailing is masterful on this historic European library furniture. The far right door has a small warp and there is a small hairline crack in one stained glass pane, see photos. For easier transport, this cabinet can be disassembled. Size is 7' 2" wide to the outside of the paw feet, 22" deep and 77 1/2" tall.